I am looking to redesign a website over which I have little control outside the colour scheme. I want to find usability evidence to back up my change decisions, or else use that evidence to adjust my proposal. The current website has a dark blue background behind the text area (#1b3676 background with #D5D4D4 text). Because of the overwhelming blueness throughout that design, I want to change to a design which instead has a more bluey-charcoal colour behind the text area (#2d3c53 background with the same #D5D4D4 text). There are to be other colour changes around the place, such as the use of an accent colour which looks better on the darker background, but the legibility of these two colour schemes is what's in question here. I've been trying to search for articles on Google which compare the legibility of light text on differently coloured dark backgrounds, but whatever I try, "dark background" is always interpreted as meaning "black background everywhere" rather than "background colour that is darker than the text colour in the reading pane". 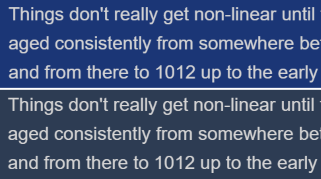 Because of this, I can't find anything to confirm or rebut my suspicion that it's easier to read the text on the less coloured background than the more coloured one, despite the fact that there is slightly higher contrast with the bluer blue. Are there any good studies or articles comparing usability of different coloured dark backgrounds? Whilst I don't have links to any studies regarding this, one great argument for color choice is accessibility. Accessibility takes into consideration color blindness and legibility of your color and text color. One way to get hard evidence, one way or the other, is to verify the contrast ratio by using a color contrast checker tool. The higher the contrast ratio, the easier to read your text will be. WebAIM provides the tool that proven and used by companies like Google. Here is the link to WebAIM. It will not be easy to find a article that helps your scenario. Because your context is very specific to your application environment. I think you should create a outline for yourself, according to the application scenario. My personal opinion of the colors you have used is, it's something related to the idea you need to convey. Weather it should be cheerful, trustworthy or dull etc. In addition to that, the longer texts are not good on the darker backgrounds. Not the answer you're looking for? Browse other questions tagged website-design color color-scheme background or ask your own question.